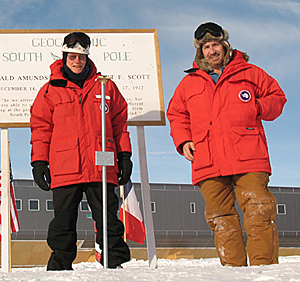 University of Delaware researcher Tom Gaisser (left) and senior electronics instrument technician James Roth stand before the marker for 90 degrees S. latitude, the geographic South Pole. The marker moves roughly 30 feet each year, as the polar ice creeps north. A new marker is installed every Jan. 1. An important function of the IceCube neutrino telescope's "IceTop" detectors, which UD is responsible for installing, is to study solar activity. When a solar flare occurs, a tremendous amount of energy is released, and matter from the sun’s corona is ejected at high velocity. 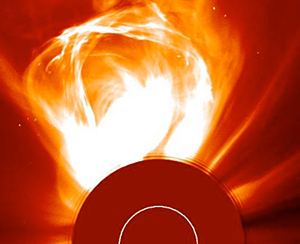 Such coronal mass ejections (CMEs) can propagate at speeds of over 2,000 kilometers per second, often producing a shock wave. In turn, this shock wave can accelerate particles with sufficient energy to interact in the atmosphere and generate secondary particles that scientists see as a sudden increase in the counting rate of IceTop’s detectors. These high-energy particles can disrupt power and communications systems on Earth. Image courtesy of the Solar & Heliospheric Observatory, an international collaboration of the European Space Agency (ESA) and NASA. 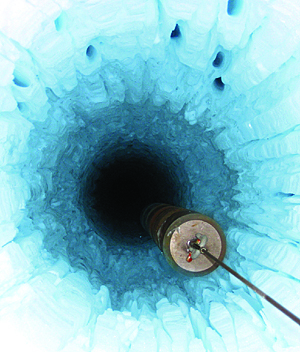 11:35 a.m., Nov. 11, 2010----University of Delaware researchers are now deploying to Antarctica to finish building a giant “IceCube.” That's the name of the telescope that, when completed in February, will cover an expanse of almost 200 football fields over a mile-and-a-half deep in the ice near the South Pole. With this new eye into the universe, scientists hope to uncover the origins of high-energy particles called neutrinos that are formed during such cataclysmic cosmic events as exploding stars, gamma ray bursts and colliding galaxies. The icy tool also will aid in monitoring explosive solar activity that can have damaging effects on technology systems on Earth. Often referred to as high-energy messengers from the universe, neutrinos zoom right through planets and even our own bodies because they are full of energy, yet lack an electrical charge. Classrooms and the public worldwide are invited to follow the scientists, from Dec. 1-15, through a UD website that will include daily blogs and photos from the researchers, a downloadable study guide, and a “phone call to the deep freeze” that will connect selected classrooms with the researchers in a live conference call. Teachers may register their classrooms for the free program now at this website. Registrations must be received by Nov. 22 to be considered for the phone call. Supported by the National Science Foundation (NSF), the classroom activities are designed to engage new audiences, including budding scientists, in the process of research, according to Thomas Gaisser, Martin A. Pomerantz Chaired Professor of Physics and Astronomy at UD. Gaisser is one of three principal investigators and currently the spokesperson of the massive project, which is being coordinated by the University of Wisconsin. The international effort began in 2004 and involves more than 30 institutions. When completed in February 2011, IceCube will consist of 86 strings, each containing 60 optical detectors, frozen over a mile-and-a-half deep in the Antarctic ice sheet. As a neutrino passes through the ice, it occasionally slams into a molecule of ice, which generates other particles that produce a flash of light as they pass through the ice from below the Earth. IceCube's optical detectors are designed to capture the flash of light and stamp it with a precise time code. From this information, scientists can reconstruct the particle's path and trace its origins, perhaps to an exploding star or the matter falling into a black hole. Gaisser and his research team from the UD Department of Physics and Astronomy and the Bartol Research Institute are completing the telescope's surface array of detectors called “IceTop,” which allows the UD group to study showers of particles from interactions of high-energy cosmic-ray particles in the atmosphere. Atop each of the 86 deep ice strings, UD researchers are installing two 650-gallon tanks of water that each contain two optical detectors. The tanks are filled with water, and the freeze is controlled to produce perfectly clear ice for monitoring cosmic activity, not just cosmic rays from outer space, but also solar activity. Coordinated by UD's Office of Communications and Marketing, “Extreme 2010: An Antarctic Adventure” is the eighth program in UD's popular online expedition series, which has won state and national awards for excellence. Previous programs focused on another “extreme” environment: deep-sea hydrothermal vents.